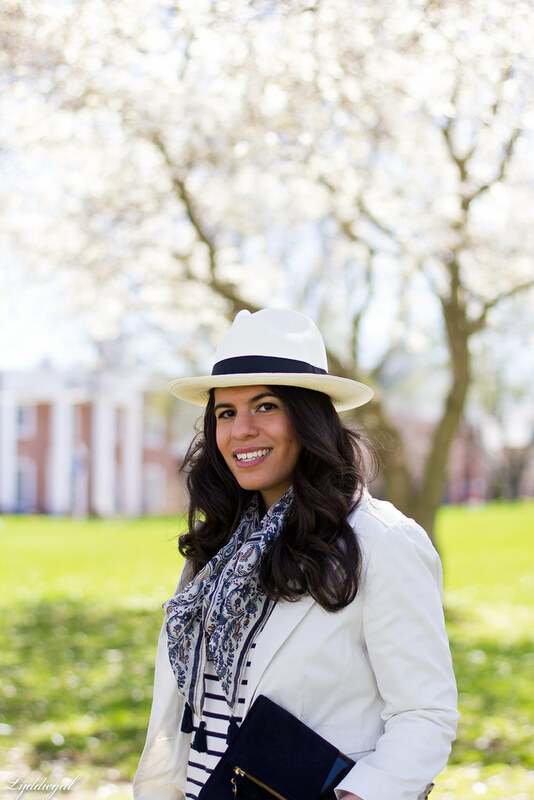 White blazer, white hat, white blossoms. I feel like I've said this before, but I think we finally hit the turning point in the weather, and Spring is truly underway. Last night at 9pm, if my car is to be believed, it was 70°. Now that, I can get used to. Sometimes I feel like I spend so much time waiting for and anticipating spring, that I forget by the time it's here the year is nearly half over. I suppose I'd better start making up for lost time. Love this outfit! The light wash of those jeans is great! And I know what you mean...I feel like the same thing happens with Fall sometimes. We wait for those "perfect" days and by the time we get one Fall is almost over. Why can't Winter be the quick season?! Super cute look made up up of closet staples. This is my kind of outfit. Love it. 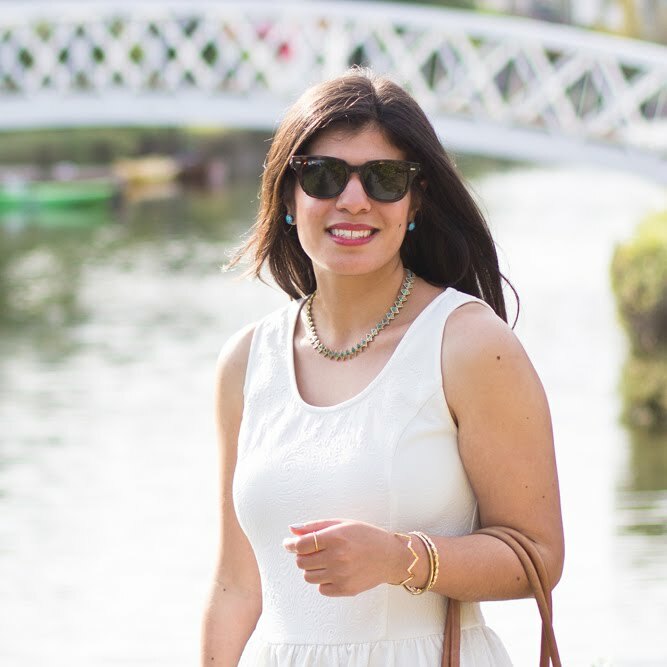 This outfit is so perfectly spring-like! And I love that it's not just immediately a summer outfit with short sleeves - I feel like I've been reading a lot of blogs where the transition from winter to summer happened over night and it never gets that warm in Vancouver, so I need inspiration that includes sleeves ;) Unbelievably, I still don't own a white blazer, and I need to correct that as soon as possible, because yours is gorgeous and there are so many ways to wear them... including yours in these photos, which I would never have considered but that looks absolutely perfectly. your hat is sharp! very cool! Yesss, get those bright whites out of the closet! You look amazing here, doll. This is such a cute look! I just love how you pulled this together you look great! I love, love, loooove your outfit! You look sooo pretty and chic!! I like your jewelry and nail polish color, too!! Such a beautiful spring look! Love the combination of whites! I know it, once spring hits the year really flies by!! 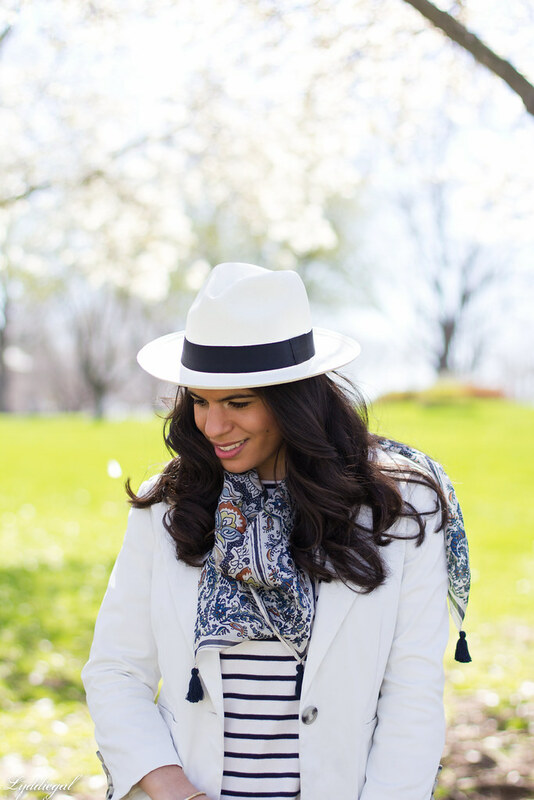 I love this spring look--the mix of patterns with the white hat and blazer make such a pretty combo! You always make casual wear look so damn elegant and sophisticated. That clutch is just perfect too, by the way. seriously this outfit is everything ! Its perfect for a getaway to napa ! Love the paisley scarf. Just gorgeous! SO SO SOO beautiful! Loving all the detail in your accessories, I love that you color coordinated with the flowers too. It makes the photos so great! Gorgeous colours and I love the way you took those photos in front of the trees. The scarf is great. Loving this white blazer on you! 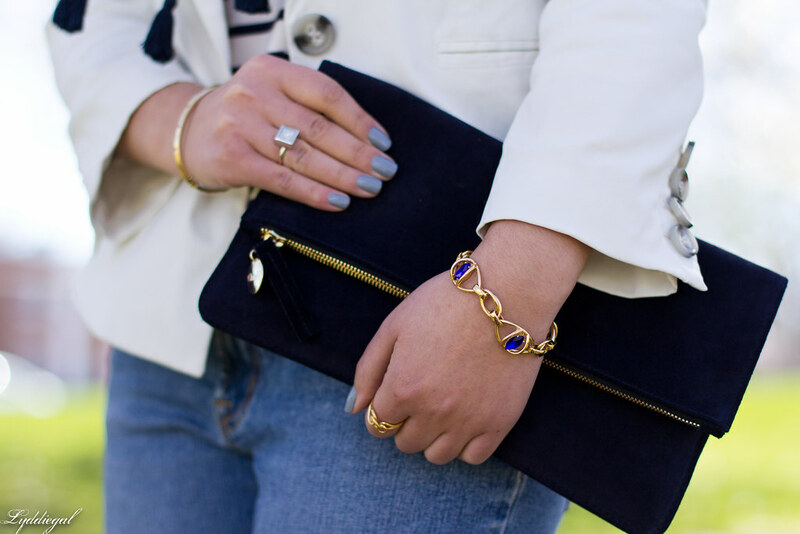 and that print mixing is so perfect! This is a sharp outfit. 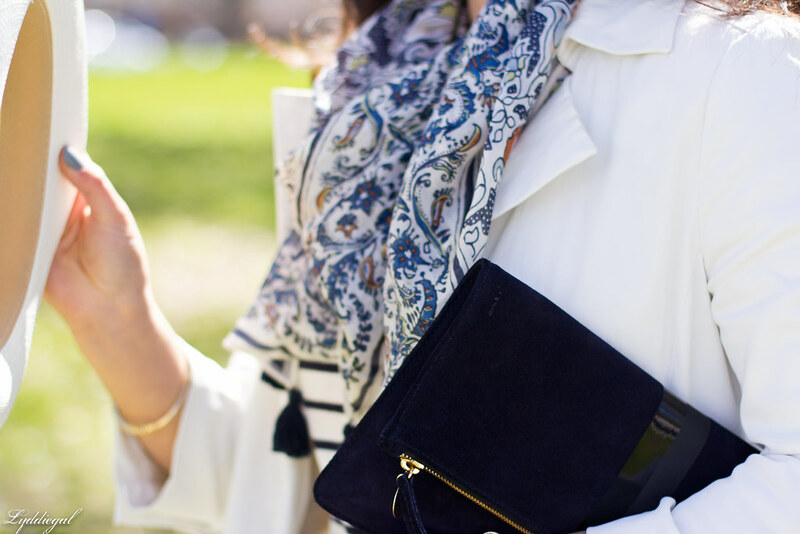 I love the print in the scarf paired with the striped shirt. Great look! Loving the scarf with the fringe! Love this look! 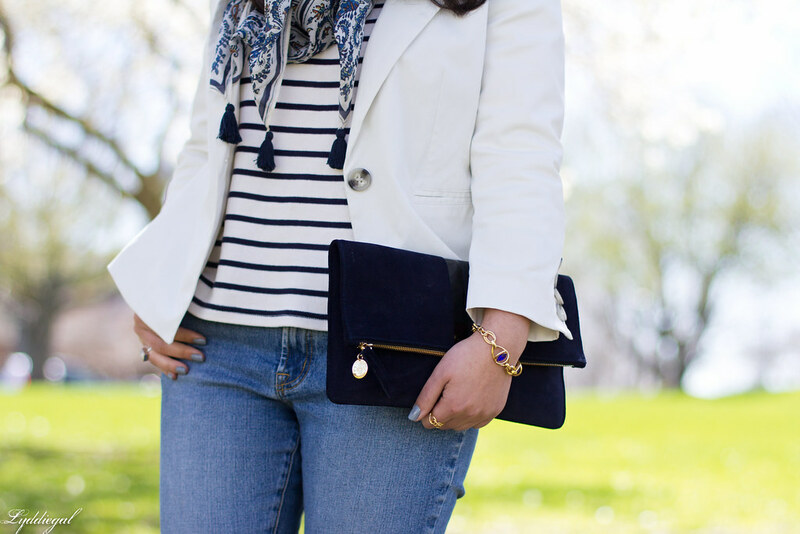 Navy and white and stripes and fringe, oh my! Such a cute fedora! 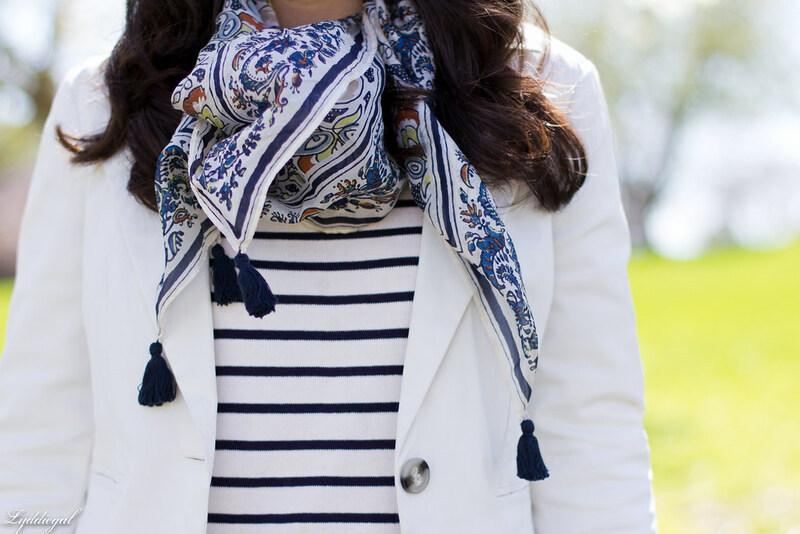 It pairs perfectly with stripes and that lovely scarf! You make such a great point. I do the very same, obsessing about cooler weather and waiting for it to change then when it finally hits it only lasts for a few days or so before we move into another season. Classic look and I love the scarf. I need to find a hat as flattering as yours. Yes, Spring is finally here! I really like that hat. I need to get on the hat train, because every blogger looks so cute in them and I don't have one! Loving this scarf! Such a cute look. Love this whole look! 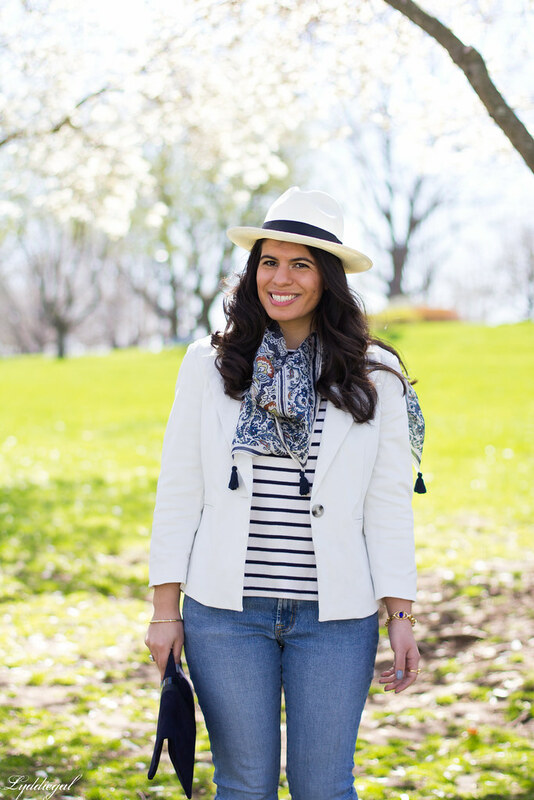 The scarf, hat, stripes, and blazer = perfect combo! I love the nautical vibe of this outfit. The white blazer with the stripe tee is perfection.